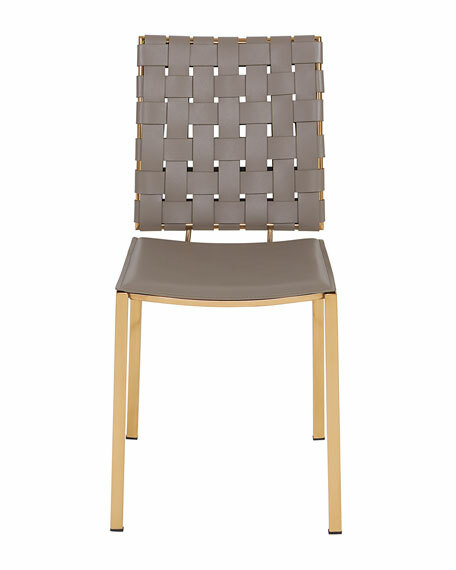 A woven back brings texture and dimension to the clean-lined simplicity of this leather dining chair. Golden finish and bonded leather seat. 18"W x 21"D x 34"T.
EXCLUSIVELY AT NEIMAN MARCUS White fabric cover with black piping. Cover cushion for Neo Classical dining chair. Fabric cover only. EXCLUSIVELY AT NEIMAN MARCUS White fabric cover with black piping. Cover cushion for Neo Classical dining chair. Fabric cover only. Polyester. 22.6"W x 20.8"D x 2.6"T. Imported. 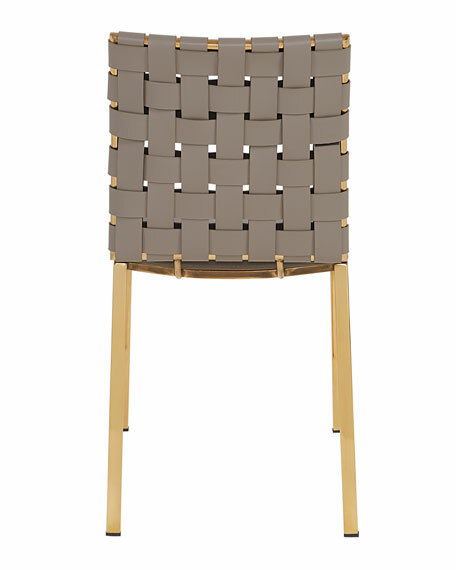 Handcrafted upholstered dining chair with attached kick-pleated skirt. Permanent slipcover with contrasting decorative tape border on base of skirt. Maple frame. Hand-painted finish on legs. Sold as a pair of chairs. 22.5"W x 24.75"D x 42"T; seat, 18.75"T. Imported. Boxed weight, approximately 70 lbs. Handcrafted chair. Birch solids and maple. Upholstered seat, metal ferrules. Stapled, nailed, and glued construction. Overall, 36.5"W x 25"D x 24"T. Inner dimensions, 20.5"W x 18.3"D x 19.5"T. Seat depth: 18.3". Seat height: 19.5". Imported. Boxed weight, approximately 24.3 lbs. 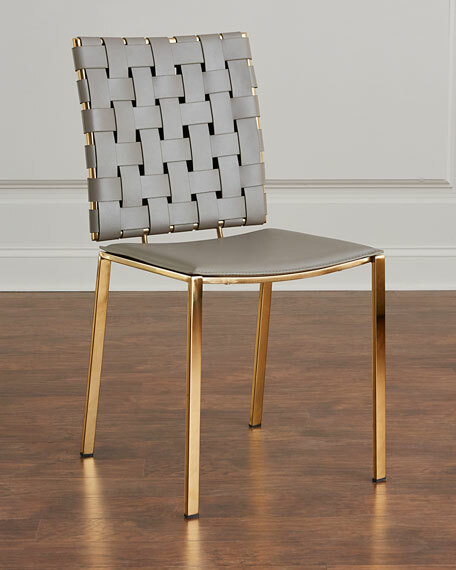 Modern empire-style dining chair. 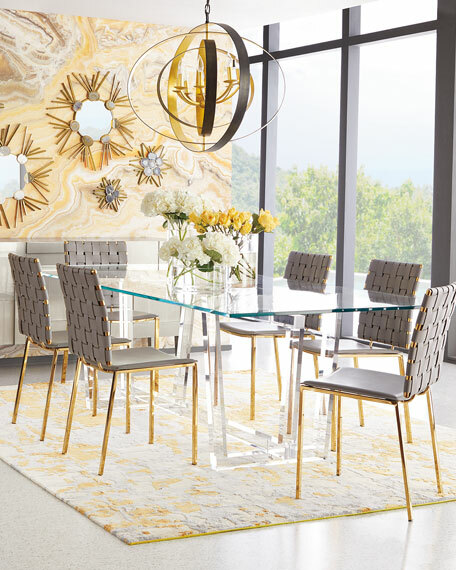 17"W x 20"D x 32"T; seat, 16.5"D x 18"T. Metal frame with polished-brass finish. Cotton velvet upholstery. Custom-tooled flower escutcheon. Petal-shaped sabots and cuffs at top and bottom of front legs. Brass petals at the outside back of chair. Imported. Boxed weight, approximately 25 lbs.